Yesterday, according to my new iPhone, it was minus 5 degrees outside. All plans of driving to a National Trust property to have scones and tea and play in the gardens or other equally ambitious ideas of going mudlarking on the Thames searching for clay pipes and roman coins were put quietly aside. Going out the door in this current cold snap is like walking into a refrigerator and closing the door behind you, but not in a *fun* way. My ‘running’ has been tossed aside for blankets and radiators and two episodes each a night of The Killing. (It is as good as everyone says, and Sarah Lund’s jumpers exceed their hype. And I now believe I can understand Danish.) All evening appointments have been cancelled, the school run has been undertaken in the car. I haven’t eaten anything other than chicken broth since Monday, and we have been through about 7 bottles of Calpol. I am waiting for my jeans to slip down off my hips in a thin snakey sickly kind of way. I thought not eating food for a week would show somehow, but the jeans still refuse to budge, the cheeks remain full, the arms plump like good italian sausages. I don’t even have romantic consumptive hollows under my eyes. WHAT IS THE POINT OF ALL THAT SUFFERING? Anyhoo. There have been two birthdays in the last two weeks. 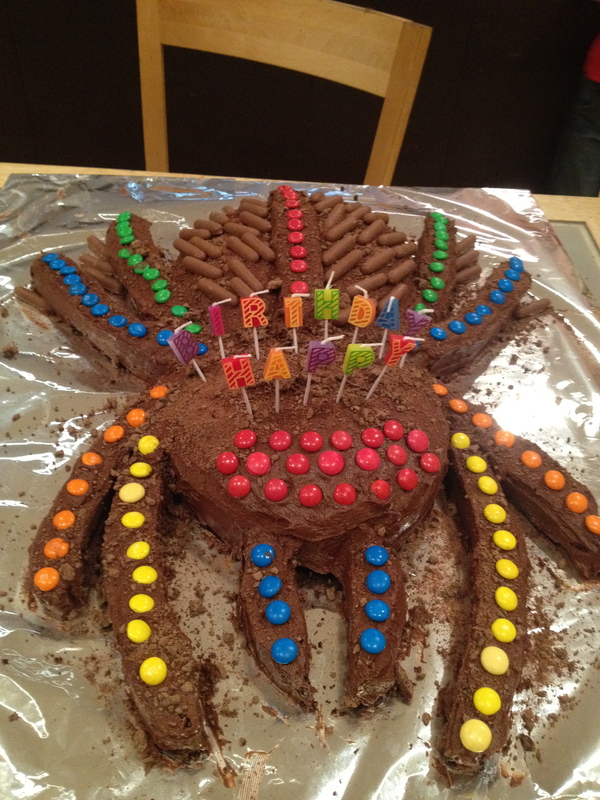 I made Barnaby a spider cake, which was specifically requested. It was a triumph, if you don’t mind the shameless bragging. 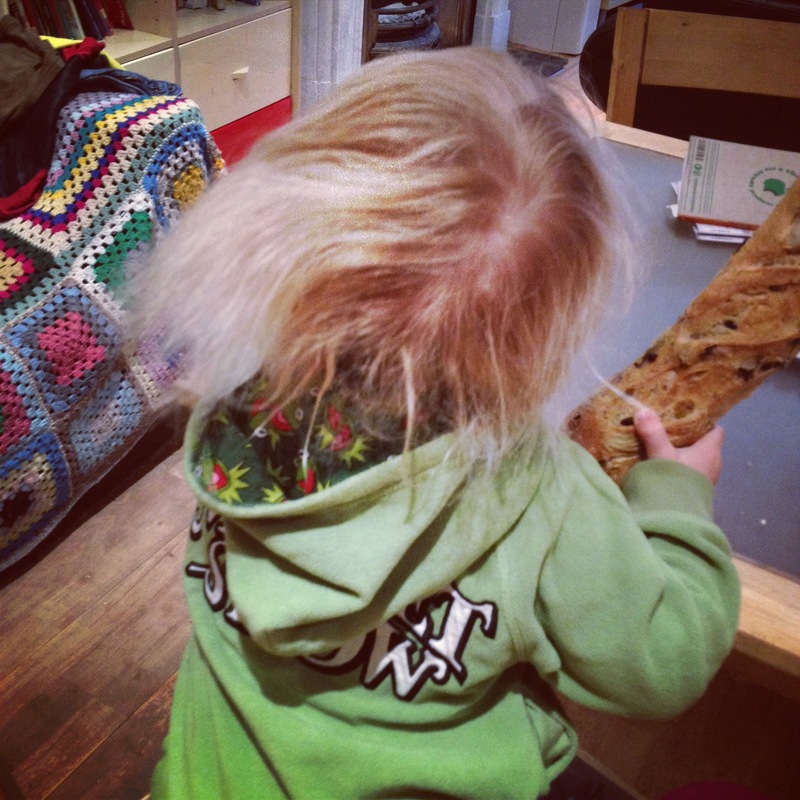 Ned then turned two and he got a supermarket cake. The rule is, if you are too small to notice that your mother bought the cake for you at the supermarket alongside sausages and toilet paper on the day of your Actual Birthday, then you are too small for your mother to feel like she was Bad. Or something like that. There is, of course, no question that birth order has quite a lot to do with all of this, and that each kid after Barnaby gets a significantly less-generous quota of the Mother-Feels-Obligated tasks. Sorry about that, small fellas, but it is biology. Beyond my control. Watch that small and chubby baby-hand, there, Son. So post-birthday we all got ill and lay down a lot and watched telly and we cried and we sweated and we coughed and we used a lot of drugs. Then we got better and now it is the holidays. HURRAH! Soooo much more fun than sweating on the couch. 6 Responses to Cold, and colds. TWO cars, Jane, TWO! Yes. It makes sightseeing of a weekend that much more fun, and quick trips to the Westfield for coffee from the New Zealand cafe now take about 4 minutes on the westway. And no accidents yet, hurrah! Ah, the delights of shared rhinovirus, it almost makes me pine for the days of whining, sniveleing noses, red-rimmed eyes and scabby nostrils, demands for “magic medicine” and deep, inner warmth. I’m just glad I discovered whisky. It doesn’t stop the symptoms, but after a few, you just don’t care anymore. PS It works on the kiddies as well. Those cakes are SPECTACULAR and it looks like a good time was had by all. I would have been the Greedy Guts that inhaled them all, leaving the others with the sandwiches. Hope you get to go mudlarking soon – that sounds excellent fun! 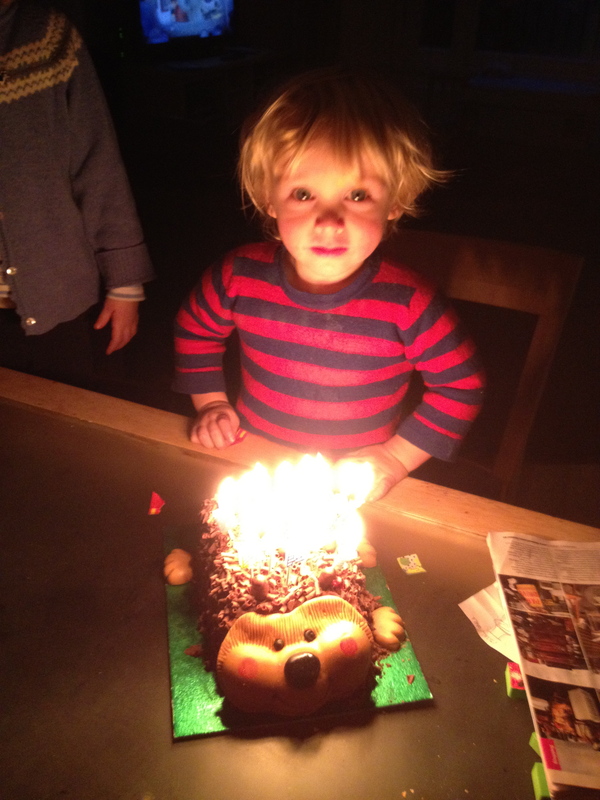 Although the spider cake is by far superior to the hedgehog the latter is still very cute and appropriate for a 2 year old. Happy birthday boys….. we are gearing up for 2 birthdays here soon. I hope you’re all feeling better now and the running can resume. I haven’t run all week and there is no sickness here to blame! 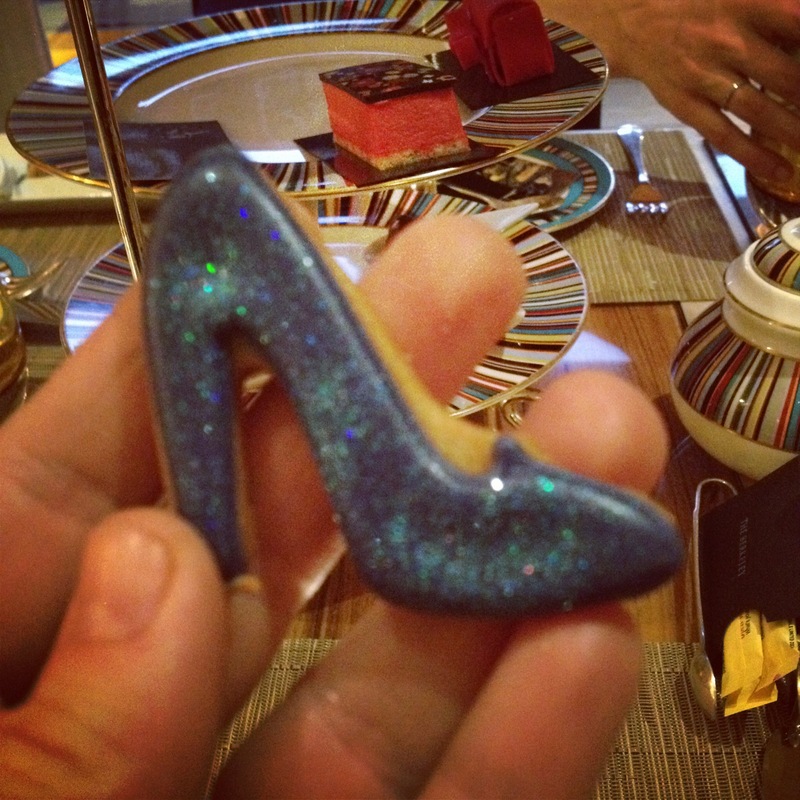 The cake rule needs formalised and publicised.